Right about now, I’m probably cruising down one of the picturesque side highways in New Brunswick or I’ve set up camp around the Bay of Fundy and dipping my toes into its muddy banks. Or maybe I’m sucking face with a lobster in Maine. Who knows, but whatever it is that I’m doing, I’m sure that I’ve got a huge grin on my face. I’m sure my face had a similarly stupid grin when I ate this sandwich. This is one of those stupid simple recipes. Correct that, it’s not even a recipe. Rather it’s a list of ingredients that is more of an idea than a step-by-step process. I think a lot of people use recipes as a guideline rather than following things to a tee…it’s what I’ve been doing since I was a kid. If you like to follow things to the letter of the law, then shake things up! Play with your food! So often I have leftovers in the fridge….small amounts of grains, leftover veg and bits and bobs hiding in corners. I hate wasting food, so I try to use up as much as I can without anything going into the trash. This veggie burger was a result of thinking I had nothing in the fridge for our meal. So wrong! When I looked closer at our fridge fixin’s, I found that I could try making some veggie burgers. Into a bowl went the Trader Joe’s mixed grains that I had cooked up for a soup the day before. I also threw in some leftover chopped vegetables and a few squares of forlorn tofu. 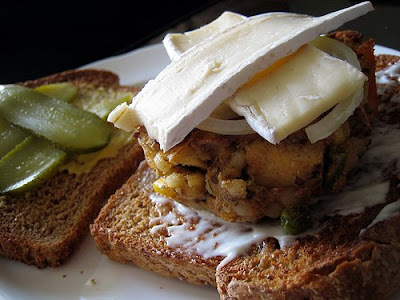 Heck, I didn’t even have buns, so I just used whole wheat toast but upped the ante with a slice or two of brie. What started out as nothing, turned into something pretty dang tasty. Add in your leftovers and spices to a bowl, toss with a beaten egg, a plop of dijon, and add in some almond meal to help bind the mixture. Too dry? Add in another egg or some broth or milk. Too wet? Add in some more almond meal. The mixture should start clumping well and holding together. Make patties and put in the fridge for 15 minutes or so to let things meld. Fry in a little olive oil until both sides are golden. Serve in buns or on toast with your favorite condiments. These look delicious, and I love that it's a meal of odds and ends – those often turn out to be the most creative AND delicious! I like to use leftover hot cereal, like Red River or Sunny Boy, and then grate up everything in the fridge to make patties. It's a satisfying thing to know you've not wasted a shred of leftovers! been meaning to try out making my own veg burgers. probably 100x cheaper than buying them! and some of the store ones are SO BAD, at least when you make them at home, you can stick whatever your want into them! Yum. Homemade veggie burgers. They're so easy to do I often wonder why folks settle for the pre-made hockey pucks. Just found your great blog. Timely, I might add…I recently had a really good veggie burger at, of all places, the hospital. I certainly don't want to go back there, but I am craving the veggie burger. Will have to try these. Oh, and the easiest cake ever – that looks delish. Thanks Emvandee, I think so too. Kali, I hope you enjoy. Homemade is always better than frozen. Mmm great way to use up leftovers! Love the brie on top. Sounds delicious, and I've been looking for a veggie burger recipe. There's a nut allergy in my family, though, so I'd want to avoid the almond meal. Do you think breadcrumbs would work? Hope you are having a perfect vacation. man I love veggie burgers from scratch and then throw on the pickles!! yes! if you are in Maine good luck with all this heat. This looks great. Can't wait until I have leftover grains in the fridge. Mmmm, so lovely. I like how that brie looks like a pair of crossed hands. Folded over. Satisfied. What a lovely blog. I feel inspired to root through the fridge door in search of a midnight snack of…I dunno…chutney and black walnuts on top of crackers? eatme, the brie was the icing on the cake, so to speak! liz, breadcrumbs would totally work! Try it out and tell me the results. Dawn, I'm so with you on the extra pickles! Yes, the east coast was sweltering!! Coversation, nice to have a boyfriend who cooks!! kirsty, this is so flexible you could use pretty much any kind of leftover! I know, Shannalee! Too funny…what would have been better is if we had met up! Dang. Fromage, yes, love your cheese sentiment! Midnight rooting is heartily encouraged. That's a great looking burger, it's very similar to some of the stuff we're making at my sandwich site. If you get a chance, I would love to hear what you think about our stuff, just leave a comment. I’m going to try this recipe real SOON! I love how easy it is. Thanks!